It may not be long till an order like that is placed at a stadium near you. Wagers at American stadiums may be as common as foam fingers and oversized pretzels, said Ted Leonsis, owner of the Washington Wizards, Capitals and Mystics. Speaking to Axios, Leonsis said sportsbooks will become ubiquitous in American stadiums, like they are across Europe. While watching a bet from the stands, fans can also place bets through their phones on game outcomes and even the result of the next play. Leonsis, a former AOL executive, said betting will be the key driver of the modern stadium experience. This also means a new revenue stream for owners, leagues and their players. In-house sportsbooks would obviously create another revenue stream at stadiums, but legalized betting would present a much broader economic impact, Leonsis said. Instead of offshore casinos or black market bookies, the government could tax these wagers and the industry as a whole would create jobs. Less tangibly, gambling also increases engagement, something all sports leagues covet from their fans. As Leonsis reiterated to Axios, an engaged fan invests more time, and spends more money, compared to a casual viewer. Opportunities to win money based on a game’s outcome, or even one of its plays, is a logical way to bolster engagement. That thirst for data give the leagues another incentive to embrace sports betting. For decades the NBA and NHL worked with all other major American sports leagues to oppose gambling, publicly professing fear that unscrupulous bettors would try to compromise the integrity of their competitions. But this opposition began to thaw along with changing attitudes from U.S. sports fans. NBA commissioner Adam Silver wrote an editorial in the New York Times in support of regulated gambling, even before the Supreme Court decision to strike down the ban, proving a watershed moment in sports betting expansion. Starting with the NBA, leagues stopped opposing sports betting and instead sought a cut of the revenues. The leagues called for one percent of all wagers, calling these “integrity fees” and arguing they were necessary to protect the came from outside influences. They dispatched lobbyists to statehouses considering legalized betting authorization, trying to convince lawmakers to include these fees in their legalization bills. Legislators rarely acquiesced. Sports betting had been legal in Nevada for decades with no demonstrable impact on the sanctity of sporting events. Many lawmakers publicly called the leagues’ requests disingenuous and just means to squeeze revenue, not as some indispensable bastion against corruption. Plus, money to the leagues meant less money for state coffers and casinos. 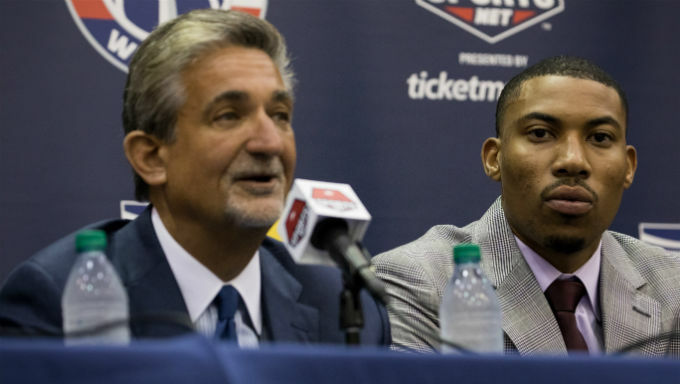 Leonsis admitted a plea for “integrity fees” was the wrong approach. Instead, Leonsis said the leagues should monetize the mountains of data it compiles on itself that’s not readily available to the general public. Invested gamblers would pay for access to any sliver of information that could give them an edge, Leonsis said. Why not sell that information? Leonsis believes that someday a bettor will be able to pull out their phone, look up a data set based off a player’s heat map and place a bet within a matter of clicks. But that reality is easier said than done. Leonsis’ progressive view is becoming more widely accepted, but its far from the dominant ideology in a country that had effectively outlawed sports betting for most of its existence. The Supreme Court decision didn’t legalize sports betting in all 50 states. It merely gave them the constitutional right to do so if they chose. About two dozen states have shown some sort of reluctance toward gambling or have outright worked against it. If the struggles of the early adaptors are any indication, it may be years until even half the country has legalized betting. Along with Nevada, which has taken bets for decades, Delaware, New Jersey and Mississippi receive legal sports bets now, with West Virginia and Rhode Island slated to do so in the coming months. These states mostly had widespread legislative and regulatory support from citizens and lawmakers, but even then it has taken months to get rules, partners and facilities in place suitable to receive bets. Pennsylvania and New York are the poster children for this struggle. Both also legalized sports betting in some capacity, but taxation and regulatory concerns have prevented either state from taking a bet. More than a dozen additional states have already introduced legislation, but weren’t even able to pass laws through their respective statehouses this year and likely won’t have a chance to reevaluate them until this upcoming January. Even then, there remain layers of ensuing regulatory procedures that could stall sports betting even further. As of today, Leonsis’ scenario of a fan placing bets from the confines of a stadium from one of the four-biggest professional American leagues is only possible in New Jersey. Pennsylvania and New York would create vastly expand those offerings, but there’s no timeline for when either would be able to take bets, or if they would even allow betting in the stadiums at all.